My dream to see this painting had finally come true! This is one of my few “most desired to see” paintings. My trip to Spain last year was one of my most satisfying ones. I did have the opportunity to visit three of the most famous museums in the world, and see three very important works of art while traveling. Lucky me! A visit to Prado Museum in Madrid was one of the most exciting programs in the itinerary. We joined a guided tour. Though the docent was excellent, I drifted away from the group when we came to this gallery where Las Meninas was placed. I was able to see this beautiful painting only a few feet away whereas my fellow travel mates were listening to the docent at the back. My attention was completely absorbed into this amazing piece of art, imagining that I was among this group of individuals drawn by Diego Velazquez who created a puzzle out of this picture. No wonder this has become one of the most important paintings in the Western World! 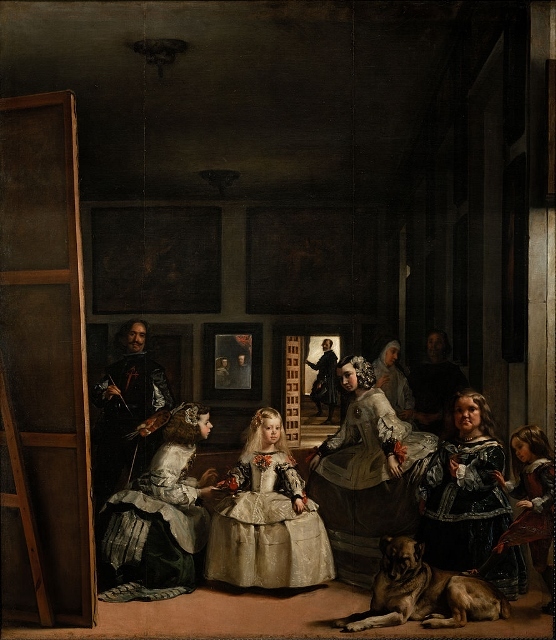 “Measuring “ten and a half feet by nine feet wide” (96), the painting’s near life-sized figures, along with its “spatial construction,” creates a sense of overwhelming realism, emphasizing complexities, such as literary-like symbolism, that confuse the viewer.” (Natalia Rivera: Diego Velazquez’s Las Meninas ). There are many intellectual discussion and interpretations of this painting. I am interested in the theory of Michel Foucault. Michel Foucault devoted the opening chapter of The Order of Things (1966) to an analysis of Las Meninas. “We have pictures not simply of what things looked like, but how things were made visible, how things were given to be seen, how things were shown to knowledge and power.” Jonathan Rajchman, Foucault’s Art of Seeing. After reading a few interpretations of this painting, I can’t help asking the same question like everybody else: What is this painting about? Is it about power? Whose power? The Monarch’s power, or the people’s? There is another very natural question: Who stands in front of the painting? Most will say “the King and the queen? No, I would say: It is me, you and me! “The viewers complete the art’ ~ Marcel Duchamp. We did see Picasso’s Las Meninas (all the 58 paintings of this suite). Which one do I like best? 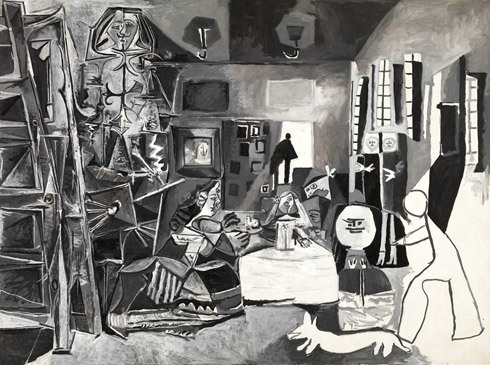 Although I am a big fan of Picasso, my answer is : No doubt Velazquez’s Las Meninas is the greatest work of art in western cultures.. Picasso is my favorite artist but his Las Meninas is not my favorite painting. My goal is to post Picasso’s most famous painting Guernica at the Museo Reina Sofía, Queen Sofía Museum next time. Stay tuned, my friends. This is posted on my art blog, but it is also part of my travel logs. I am posting it here to share with my travel blog readers too. Hope you will like it!